yet I sure was excited by the delivery. Such honesty about adult life and the trouble of it all, paired with lush music, was too much to resist. 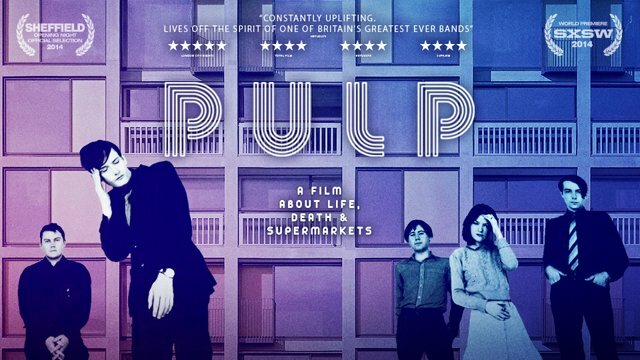 The documentary, Pulp: A Film About Life, Death & Supermarkets(2014), directed by Florian Habicht, is an exploration of how the band Pulp evolved as well as the city they hail from, Sheffield, England. This is not a concert film or even a strict biographical overview, it’s more of a series of portraits of the residents of Sheffield and how the band Pulp fits into the city. There are multiple interviews with Sheffield residents young and old and how they feel about the band. All generations are equally proud of their hometown band, with varying levels of knowledge of their musical output. Some amusing episodes involve an older woman critiquing why Pulp is better than Blur and a young girl hearing Disco 2000 for the first time and meekly stating that it might be good to dance to. The interviews with Jarvis Cocker and the rest of the band reveal some insights on their relationships and how their sound changed over 20 years. We see the drummer Nick Banks, who coaches his daughter’s soccer team, complete with Pulp-sponsored kits, looking like a fairly normal guy. Keyboard player Candida Doyle speaks of how an early diagnosis of arthritis lead her into music, which helped her to overcome her affliction. The other band members are shown to be equally regular, or Common People, even Cocker to an extent. Jarvis is obviously the most noticeable member of the band and speaks about how celebrity was not much to his liking. For such a revered and celebrated band, this documentary almost makes them seem like a humble outfit from a small city who just happened to stumble into stardom. A very interesting stylistic choice for both the band and the director; too self-deprecating to admit their own excellence, they downplay their successes and strive to still be of a Sheffield-mindset. The cinematography displayed in this film is masterful. Not to be unkind, but Sheffield, England is a little rough around the edges. The camera captures the housing schemes, graffiti and fish markets with crisp clarity. Sheffield may not be the most aesthetically pleasing city; the people are the real draw. The most engaging portion of the film is a vignette in which a diner full of elders sing Help the Aged. Hearing the lyrics “Help the aged/One time they were just like you/Drinking, smoking cigs and sniffing glue” sung with playful gusto by a group of white-haired seniors is delightful and touching.